Here we are with the statistics derived from the two timelines of February (part I and part II). This month the toll is quite high: I have collected a total of 165 events as I have considered each breach of the three mega leaks that Gnosticplayers released this month as a single event. The above leaks clearly characterize the Daily Trend of Events chart (primarily on the 11th and 15th). As usual there is no activity on the weekends (except on the 17th when the third mega leak by Gnosticplayers was released. Cyber Crime ranks obviously on top of the Motivations Behind Attacks chart, with a level similar to the previous month (88.5% vs 88.1%). Similarly to Cyber Espionage (7.3% vs. 7.1%). 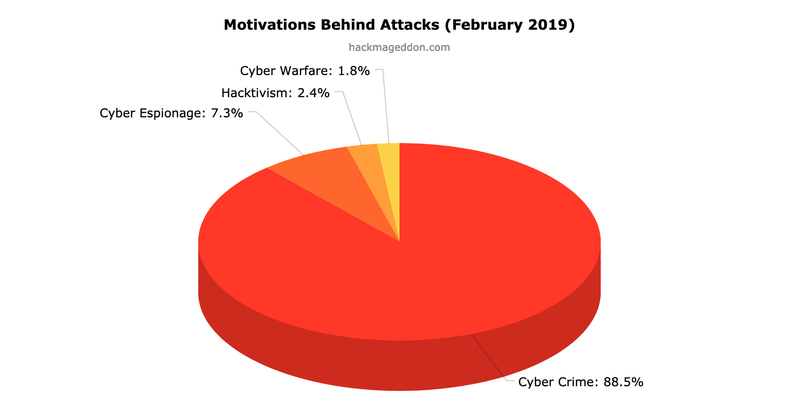 Hacktivism is back to the levels of December 2018 (2.4% vs. 2.6%), while Cyber Warfare drops to 1.8% from 4% recorded in January. Even this month malware ranks on top of the Attack Vectors chart, with 37% from 34.1%. Account hijackings slide to 13.9% from 24.6%, and also targeted attacks slide to 7.1% from 9.1%. For the second month in a row, single individuals rank on top of the Targets chart, despite their percentage drops to 26.1% from 35.7%, once again ahead of multiple targets (13.9% vs 11.1%), and healthcare (9.1% vs 9.5%).